Businesses all around the globe are competing for customer loyalty and money. Good sales and marketing strategies will bring customers through your door but without an effective customers service strategy, customers are less likely to stay and return. A lot of customer service strategies start with well trained and positive staff, but giving them the tools to provide this service will allow them to be more proactive and efficient in the work they do. That is where Fortifi Support steps in. Ideal for any company size, from small teams to enterprise, Fortifi Support is a comprehensive software where automation and intelligent priorities help simplify work for your agents. Fortifi Support's comprehensive ticketing system is designed to handle all of your customer communications in a singular platform. Growing businesses are always looking for ways to improve and through Fortifi’s details reporting system on data such as response times and customer satisfaction, you can use these insights to find weak points in your strategy and reach your goals. Through tracking and prioritising features, agent efficiency can be greatly improved and by assigning tickets to a specific agent and setting SLA’s on urgency and response times, managers can determine if their staff are meeting deadlines. Fortifi also allows teams to set up canned responses to ensure customer wait time is kept to a minimum and to avoid wasting time sending the same responses over and over again. An online chat system provides your customers with the ability to gain immediate help when they need it. When users are browsing your website, they will have questions about your product or service and with a good live chat tool you can answer those immediately. In one powerful tool, agents can increase their efficiency with Fortifi by handling multiple chats at once, in turn reducing the costs in hiring more representatives to handle the enquiries which would normally be taken over the phone. With Fortifi, managers can view and download reports on data such as claimed/missed chats, average customer wait time and customer feedback. 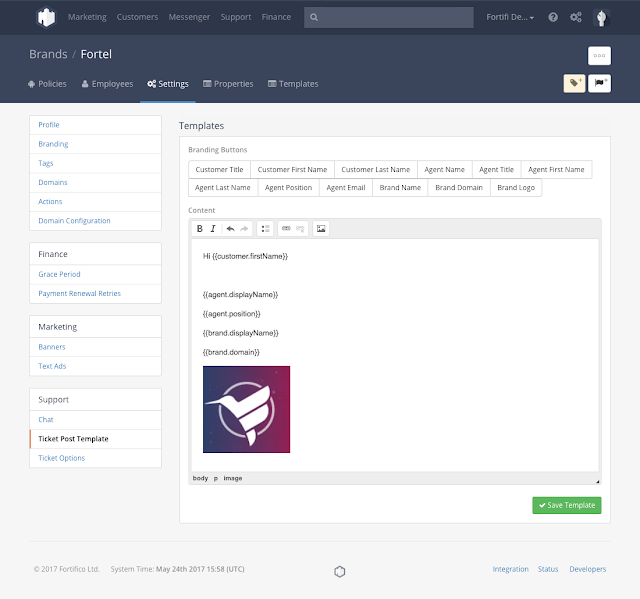 Fortifi puts customer support needs in one place using powerful features to support any size business in their support operations. If you are looking for an intuitive, feature rich and affordable customer support platform, get in touch with us today and give our free trial a run to see for yourself how Fortifi can help improve your customer service strategy.